The Threatend Species Programme (TSP), was funded by the Royal Norwegian Embassy from 2004-2009 is a monitoring and reporting programme that is divided into plant and animal units. The plant component comprises the Red List of South African Plants and the Custodians of Rare and Endangered Wildflowers (CREW) programme. The TSP is mandated to monitor and report on the conservation status of South Africa’s indigenous plant and animal species. 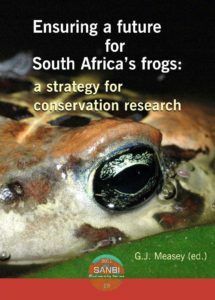 The TSP co-ordinates the collection of information on species, particularly those that have historically received little research and conservation attention, such as reptiles, spiders and marine fish, through projects involving volunteers from the public, scientists, taxonomists and conservationists from partner institutions across the country. The data collected through these projects are used to assess species’ risk of extinction against the International Union for Conservation of Nature (IUCN). 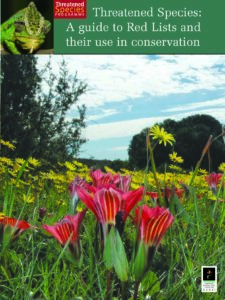 In addition, the TSP co-ordinates and promotes the application of threatened species information in all spheres of biodiversity conservation – from national and international conservation legislation and policy, to conservation planning, protected area selection, protection of threatened habitats, and ex-situ breeding programmes within the SANBI National Botanical Gardens. South Africa’s Plant Conservation Strategy is a Centre for Biological Diversity (CBD) responsibility whereby SANBI is the designated focal point. 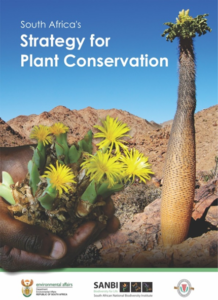 South Africa developed a response to the Global Strategy for Plant Conservation in 2006; however, a strategy that directed focus to gap areas was needed. Each of the 16 targets includes background on the work done to date, prioritises key areas of work needed, identifies 2-3 major outcomes for 2020, and includes a work plan with actions, timeframes, responsible stakeholders thereby making the strategy achievable. SANBI has worked in partnership with host research institutions, and conservation NGOs to document our species diversity and assess its threat status using the IUCN 3.1 Red List Categories and Criteria. 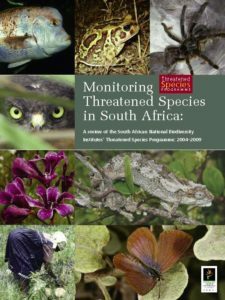 We are working towards South Africa’s official site for Species Information and National Red Lists with information on South African animal species including their descriptions, their ecological requirements, their distributions and documentation linked to threat assessments. Freshwater species is also included here. In one of the continent’s largest collaborative conservation projects to date, South Africa has become the first megadiverse country to fully assess the status of its entire flora. The Red List of South African Plants provides up to date information on the national conservation status of South Africa’s indigenous plants. A subset of species are prioritised for reassessment and is republished on an annual basis. In one of the continent’s largest collaborative conservation projects to date, South Africa has become the first megadiverse country to fully assess the status of its entire flora. The Red List of South African Plants provides up to date information on the national conservation status of South Africa’s indigenous plants. SANBI has worked in partnership with host research institutions, and conservation NGOs to document our species diversity and assess its threat status using the IUCN 3.1 Red List Categories and Criteria. We are working towards South Africa’s official site for Species Information and National Red Lists; with information on South African animal species including their descriptions, their ecological requirements, their distributions and documentation linked to threat assessments. Freshwater species is also included here. 6. South African National Survey of Arachnida (SANSA) will be available in the near future.